I was thinking that was the one you were referring to. I like that one too, and also walk through it periodically. Besides the height (and the cost), it also needs a pretty big parcel size. I was out exploring around a week or so ago, and actually saw one. I can't remember where that was though. It didn't look as out of place as one might think. That treehouse is gorgeous! If I wasn't squatting living at Rhonda's place that would be an ideal place for me. My home is mostly a changing room. Lots of lights (but no lamps or anything), a few chairs and a bed. Clover put a sign over my throne that say "Coffee Shop" and I think there is a tray of sushi sitting on the floor. 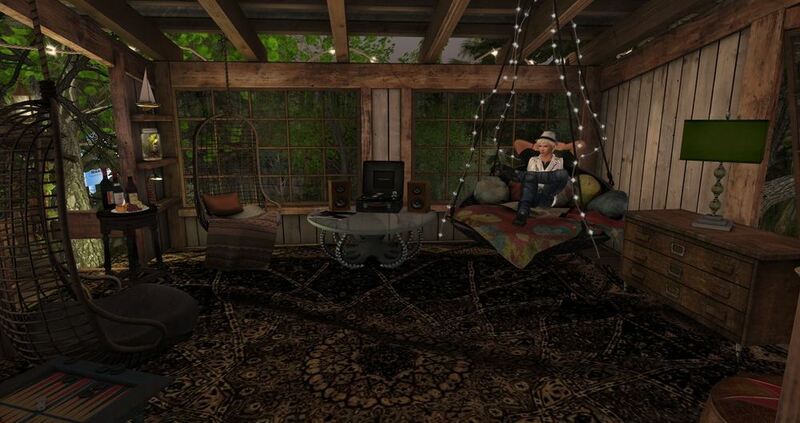 It is a simple little space in a Linden home but it has grown on me. Even if we go back to a larger parcel I'll probably keep this for our daily SLife. Has it always been against forum guidelines to post a link to the MP? Internal links were fine. Links to searches had a better chance of staying but for the most part, MP links to answer someone's question have been OK. Did this change? Very pretty, especially the cabinet in the corner. It looks very relaxing. It was generally frowned upon to recommend products and services in the Answers forum, but it's okay here. As long as you're comfortable... and you save on tier or rental fees I sometimes wonder if I really need the cost each month of the land I have, and having more than 1 house most of the time. 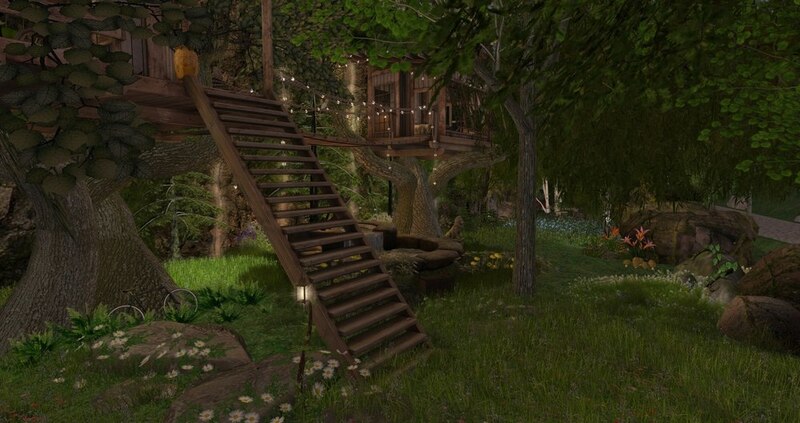 However, that is where I get a lot of my enjoyment and relaxation from in SL. This is my creative outlet - the landscaping and the decorating (within the means and abilities I have). I still can't terraform very well, but I feel that I've come a long ways from some of my first attempts here. I am getting 130 LI on basic and 161 for the deluxe version. It looks like there is some new terminology since many years back when I spent more than a few minutes here and there inworld. The card that came with the treehouse mentions 'L.I.' and 'LI' is also reference here. Based upon a previous post by someone else that specifically said 'prims' and gave different numbers, I'm assuming that LI is not exactly prims, but maybe related? Is it similar to the avatar ARC value from years back? Edit - (fixed formatting) - Also, one of the cards says "Land Impact' - so is that kind of like ARC, since it seems to not be exactly 'prims'? It's similar to the current avatar complexity (which is related to the old ARC values) but avatar complexity estimates the load on the viewer to render an avatar rather than the load on the system. Par's got secret caves, too. Food for the eyes and the imagination. My taste has also changed a lot over the years. I now prefer smaller homes with more wide open space. I often found that I used limited sections of the house most of the time anyway—so having a extremely large home just felt like a waste. I also never really cared for the scaling in those larger homes. The room dimensions feel so far off. They both need about 25m X 20m bit of land. So they would basically fill a 512sqm plot. According to the notecard, the basic one fits a 512 and the deluxe fits a 1024. They are identical in all respects but one - for the 512 version, the tree itself spreads less. I didn't actually rez the deluxe one but, judging by the pics here, that looks like the only difference. @Chase01 Thanks! The picture is from the region I'm setting up for rentals. I do have a house there, but it's not in the picture (and only partially decorated -- it's low priority). The house in the picture is one of the ones I set out from my inventory to see what the place might look like. I like small houses too. They don't take too long to furnish and decorate, and they leave more room for landscaping. I try to make sure the houses can be resized down before I buy. I don't like having doorknobs at my chest level and feeling like a kid trying to look out the windows. Maddy mentioned caves -- no caves on this region, though I've started doing some exploratory digging. I had an extensive tunnel & cave system on the homestead region I used to rent. The entrance was behind the waterfall shown in my signature section. @Parhelion Palou I'd love to come see it sometime! Feel free to message me in world or drop me an LM or shoot me a mesage. Is this your region or a project for someone else? My treehouse on the mainland. Links to Marketplace are often deleted. Obviously this sort of makes sense as anyone with a few alts could make all sorts of "advertisements" that seem like they are answering questions -- such as the "can someone tell me who made this hair" posts. MY question is WHERE ARE THE GUIDELINES? They use to be pretty obvious but seem like they are in hiding in this new system (which I give lots of kudos to in general by the way). MY question is WHERE ARE THE GUIDELINES? Back out of this thread and in to the General Discussion forums. It's the top two pinned topics. And why they are only there I cannot imagine, and I have asked Lindens in the forums several times, no response. There should be a link in the header menu methinks. Thanks for letting me know where they are. I HAVE looked before. And yes it was "advertising" :D.